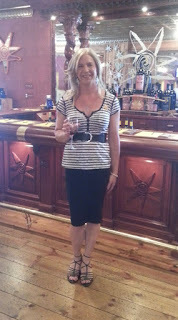 I have enjoyed doing the upstate NY wine tasting tours. Hitting one winery after another is fun but you have to watch how much you are tasting. One day I would like to do it in a skirt and top like those you are wearing. Perhaps tonight I may head home and put on an outfit similar to the one you are wearing and uncork a bottle and sit out on the deck. I was able to taste some wines once while in NY. I don't remember where it was. I thought maybe somewhere out on Long Island, but are there even wineries out that way? It is fun tasting while dressed, but it is a bit unnerving sometimes as there are often very close and frequent encounters with others. Everyone has always been super nice, but it was difficult at first to just relax and speak to the muggles like a normal person! Lovely as always, and I think your arms are fine (in case you were wondering!). They look entirely feminine to me. Thanks Annie! I appreciate the arms comment!